If anyone was expecting the uproar surrounding Nike’s controversial decision to use Colin Kaepernick in its new ad campaign to simmer down, brace yourself. ESPN reports that the company is planning to run the first video version during the NFL’s opening game Thursday, where it is sure to ignite more outrage. The spot is called “Dream Crazy,” and is the second film in Nike’s JDI series, designed to celebrate 30 years of the “Just do it” tagline. 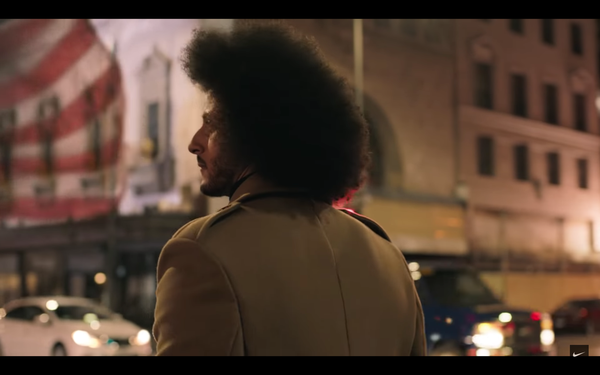 Kaepernick, who is seen as either a great civil rights activist or a disrespectful troublemaker, depending on whom you ask, voices the ad. It includes appearances by other Nike professional athletes like LeBron James, Serena Williams and Odell Beckham Jr. But it also shows off the skills of amazing athletes you’ve never heard of, like 29-year-old wheelchair basketball player Megan Blunk, who took gold in Rio in 2016; Isaiah Bird, born without legs, a 10-year-old wrestling champ; and Alicia Woollcott, who managed to play linebacker and get named homecoming queen during her senior year. ESPN reports that Nike kept the news that Kaepernick would be involved in a future campaign from key players both inside and outside the company, including the NFL, its largest sponsored teams and retailers. Nike has been the official apparel supplier of the NFL since 2012, and recently signed a 10-year deal to remain the official apparel supplier of the league through 2028. In a surprise move, the NFL, which has banished players who protest the anthem to locker rooms and recently lost a legal round to Kaepernick’s collusion case, actually praised Kaepernick in a statement. Nike’s stock did fall from $82 per share to $80 and is recovering a bit. But it is still near its highest level in years, up sharply from the $50 range it traded in a year ago. For Nike, the Kaepernick hoopla is just part of a larger plan to celebrate “Just do it” around the world. It’s already released the first in the JDI series: "Voice of Belief," starring Serena Williams. And earlier this week, it released its frisky, feminist “Juntas Imparables,” or “Unstoppable Together.” Its first JDI campaign for Nike Women in Mexico, the humorous spot features well-known Mexican athletes sprinting through Mexico City’s infamous traffic and is linked to a cause-marketing campaign that translates women’s running minutes to donations for a children’s charity. 4 comments about "Nike Digs In, Will Run Kaepernick Ads On NFL Season Opener". Don Mitchell from Allied, September 5, 2018 at 9:04 p.m.
All real Americans hope they totally fail. Laurie Sullivan from lauriesullivan, September 6, 2018 at 11:57 a.m.
Poor choice on Nike's part. They just lost me as a customer. Yep, I'll "dream crazy" of the day the NFL no longer pays him. Jim Thompson from Temple University, September 6, 2018 at 12:55 p.m. The surveys that I have conducted, formal and informal, of Nike's new campaign have been overwhelmingly positive. John Grono from GAP Research, September 6, 2018 at 9:55 p.m. I wonder if those who vehemently oppose Kaepernick's stand, realise the role of Green Beret Nate Boyer. It was Boyer who convinced Kaepernick to kneel during the national anthem and flag ceremony, because that is the position taken by military personnel when paying last respects to a fallen colleague as the flag is draped over the casket.